Cleopas and his friend should have been happy. The resurrection had just taken place! But they were sad and discouraged. 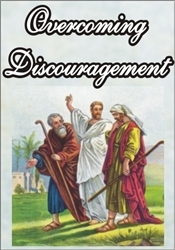 Jesus personally talked to them and helped them with their discouragement. What should you do when discouraged? Try to understand why. Discouragement is often a reaction to a real or an imagined loss. It may also be because of false expectations. Ask yourself several key questions to understand why you are discouraged. Talk about your discouragement with the right people. Talk to the Lord! Also talk to someone who is spiritual. Listen to truth until you get a fresh perspective. Then get up and get moving and attack your mountain of discouragement and depression one step at a time. After heart surgery and 4 weeks in the hospital, Audry Cox’s kidneys failed and she had to go on dialysis. Then the dialysis didn’t work and also made her terribly sick. She said, “Pastor Davis, is it wrong for me to refuse any other treatments so I can just go on to Heaven? I’m not afraid to die. I’m just tired of being sick.” With her husband of many years by her side, here was Pastor Davis’ answer!